My business card states that I am head of the special formats cataloging unit. It’s an odd title – one of the many unusual titles that people who work in libraries have. Even speaking to an audience of librarians, special formats is such a broad classification that it requires some explication. Indeed, one could replace “cataloger” with “librarian” and you would have an excellent directive for all librarians, and a pertinent reminder for me as a first-year academic librarian – that I work to serve the patron, and their ease and convenience should be foremost in our minds in the work we do as librarians. In addition to theses and dissertations, our unit is also responsible for a wide array of other media formats – video, microfilm, and internet resources. When I arrived, there was a sizable (but not insurmountable) backlog of microfilm and microfiche, as well as a few CD ROMS. With the “newbie” energy I had, I tackled those backlogs so that users could find those items in the catalog, and use them. Your energy and enthusiasm as a new academic librarian can be put to uses that help the user – but just because you are new doesn’t mean you need to reinvent the wheel. Take time to learn not only how things are done, but why. Work in an appropriate way to change the things that need changing – and direct your enthusiasm on projects that you might not want to do later on. Working on that backlog was perhaps not the flashiest of projects, but it’s something that helped the user and the department almost immediately. I’ve already identified some things I would like to change long-term, things I could not really do on my own. I need to build consensus to do these things – building consensus on “big” things both inside and outside the library being a major part of that “work in an appropriate way” idea I mentioned above. Another reflection that comes to mind is that it’s important to adjust to change, and to accommodate new opportunities. Though not in my job description exactly, I’ve been working on a digital project of early Arkansas history, the Colonial Arkansas Post Ancestry digital collection. It has been an exciting opportunity for me to hone my skills in CONTENTdm, and to gain some interesting knowledge not only of early Arkansas history, but also the history of the colonial Americas. Being open to this change and the new opportunity it represented has not only made me a more effective professional, but also has provided me with an opportunity to collaborate and work outside the library and serve the needs of a very wide community – one beyond the library here, and even beyond the state of Arkansas. Putting the user – faculty, staff, student, and even worldwide users – first helps me be centered in my daily work as a new academic librarian. Keeping the user first in any work that a librarian does is something we should all strive for. ACRLog welcomes a guest post from Bohyun Kim, the Digital Access Librarian at Florida International University Medical Library. She blogs at Library Hat (http://bohyunkim.net/blog) and can be found at @bohyunkim (http://twitter.com/bohyunkim) in Twitter. She also writes regularly on ACRL TechConnect blog. Today’s library users do not carry pencils and notebooks to a library. They no longer want to be isolated to concentrate on deep study or contemplative reading when they are at a library. Rather, they have the dire need to be connected to the biggest library the human race ever had, the World Wide Web, always and even more so when they are at a library walking through the forest of fascinating knowledge and information. The traditional library space packed with stacks and carrels does not serve today’s library users well whether they are scholars, students, or the public visiting a library for research, study, or leisure reading. As more and more library resources are moved to the fast and convenient realm of the World Wide Web, libraries have been focusing on re-defining the library space. Now, many libraries boast attractive space almost comparable to trendy, comfortable, and vibrant coffee shops. The goal of these new library spaces are fostering communication, the exchange of ideas, and social learning. However, some library patrons complain about this new and hip research and reading environment that libraries are creating. They do not experience comfort and excitement, which today’s libraries strive to provide in their new coffee-shop-or-makerspace-like library space. These patrons rather miss the old dusty moldy stacks packed with books, many of which were left untouched except by a handful of people for a very long time. 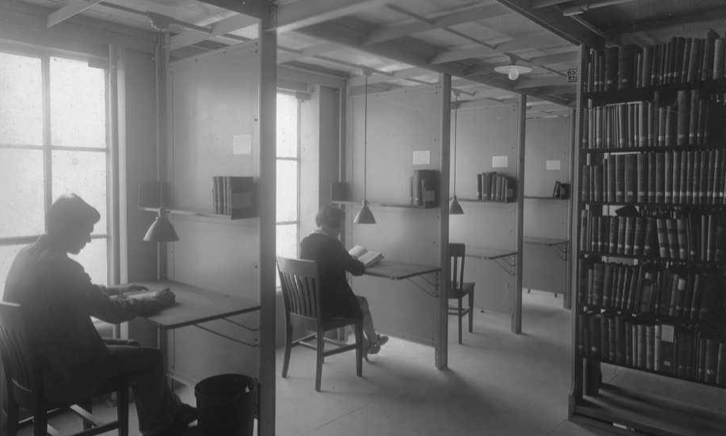 They miss the quiet and secluded carrels often placed right outside of the stacks. They say that browsing a library’s physical collection in those stacks led them to many serendipitous discoveries and that in those tiny uncomfortable carrels, they were completely absorbed into their own thoughts reading away a pile of books and journals undisturbed by the worldly hustle and bustle. This is an all-too-familiar story. The fast and convenient e-resources in library websites and the digital library collections seem to deprive us of something significant and important, that is, the secluded and sacred space for thought and contemplation and the experience of serendipitous discovery from browsing physical library collections. However, how much of this is our romantic illusion and how much of it is it a real fact? How much of this environment made our research more productive in reality? In the closing keynote of 2012 ACCESS Conference last Sunday, Bess Sadler, the application development manager at Standford University Libraries noted the phenomenon that library patrons often describe the experience of using the physical library collection in emotional terms such as ‘joyous,’ ‘immersive,’ and ‘beautiful’ characteristic to our right brain whereas they use non-emotional terms such as ‘fast’ and ‘efficient’ to describe their use of a library’s online/digital resources. The open question that she posed in her keynote was how to bring back those emotional responses associated with a library’s physical collection to a library’s digital collection and its interface. Those terms such as ‘joyous,’ ‘immersive,’ and ‘beautiful’ are often associated in a library user’s mind with their experience of serendipitous discovery which took place while they were browsing a library’s physical book stacks. 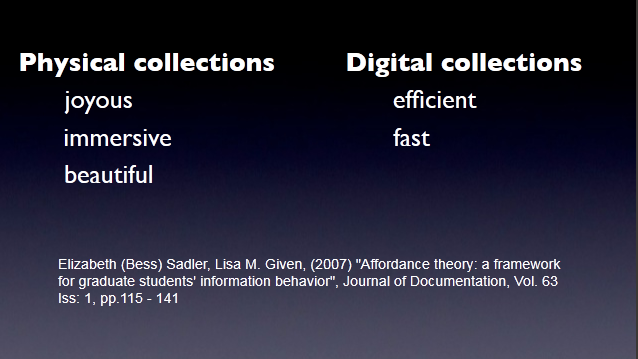 Sadler further linked the concept of serendipitous discovery with the concept of ‘flow’ by Csikszentmihalyi and asked the audience how libraries can create such state of flow with their digital collections by improving their interfaces. This was a very interesting question to me because I have been mostly thinking about the concept of flow in the context of library services (and more specifically, gamification applied to libraries) and the usability of the systems that serve a library’s online resources. The most annoying thing about the e-resources that today’s libraries offer is that the systems where these resources reside do not smoothly fit into anyone’s research workflow. How can you get into a zone when the database you are in keeps popping up a message asking if you want to renew the session or demands two or three different authentications for access? How can you feel the sense of smooth flow of thought in your head when you have to navigate from one system to another with puzzling and unwieldy interfaces in order to achieve simple tasks such as importing a few references or finding the full-text of the citation you found in an e-book or an online journal you were reading? Today’s research environment that libraries offers with its electronic resources is riddled with so many irritating usability failures (often represented by too many options none of whose functions are clear) that we can almost safely say that it is designed anything but for the ‘flow’ experience. The fact that these resources’ interfaces are designed by library system vendors and light years outdated compared to the interfaces available for individual consumers and that librarians have little or no control over them only exacerbate the problem. So I always associated the concept of flow with usability in the library context. And considering how un-user-friendly the research environment offered by today’s libraries is overall, asking for ‘joyous,’ ‘immersive,’ or ‘beautiful’ appeared to me to be a pretty tall order. But more importantly, the obstacles to the ‘flow’ experience are not unique to online resources or digital libraries. Similar problems do exist in the physical collections as well. 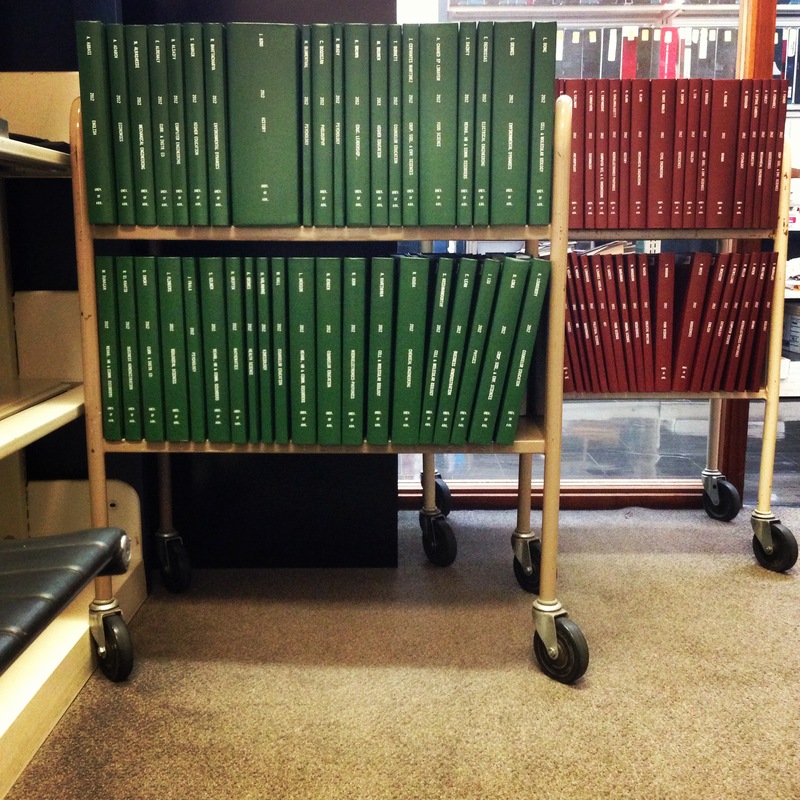 When I was a grad student, the largest library collection in North America was available to me. But I hated lugging back and forth a dozen periodicals and monographs between my apartment and the university just to get them renewed. (This was the time before the online renewal!) After the delightful moment of finding out in the online catalog that those rare scholarly books that I want are indeed available somewhere in that large library system at Harvard, I grumbled at the prospect of either navigating the claustrophobic rows and rows of stacks at Widener Library in order to locate those precious copies or running to a different library on campus that is at least a half mile away. At those times, the pleasure of browsing the dusty stacks or the joy of a potential serendipitous discovery was the last thing that I cared for. I was very much into my research and exactly for that reason, if I could, I would have gladly selected the delivery option of those books that I wanted to save time and get into my research flow as soon as possible. And I did so as soon as my university library started moving many books to an off-site storage and delivering them on-demand next day at a circulation desk. I know that many faculty at academic institutions strongly protest against moving a library’s physical collection to an off-site storage. But I confess that many times when the library catalog showed the book I wanted as located on the stacks and not at the off-site storage, I groaned instead of being delighted. I won’t even discuss what it was like to me to study in a library carrel. As an idea, it is a beautiful one to be immersed in research readings in a carrel; in reality, the chair is too hard, the space is too dark and claustrophobic, the air is stale, and the coffee supply is, well, banned near the stacks where those carrels are. Enough said. The point I am trying to make is that we often romanticize our interaction with the physical stacks in a library. The fact that we all love the library stacks and carrels doesn’t necessarily mean that we love them for the reasons we cite. More often than not, what we really like and miss about the library stacks and carrels is not their actual practical utility to our research process but the ambiance. Strand, the used bookstore in NYC is famous for its 18 miles of books. Would you walk along the 18 miles of books even if you know in advance that you are not going to make any serendipitous discovery nor find nothing directly useful for your research topic at hand? Yes you bet. Would you walk by the stacks in Trinity College Library in Dublin, UK even though you are not doing anything related to research? A very few of us would say ‘No’ to such an invitation. Can you resist walking between these stacks? Our desire doesn’t always correspond to its practical utility. But the fact that library stacks and browsing them may contribute very little to the actual research output doesn’t mean that the stack-browsing is therefore not useful. To borrow the words of Saint-Exupéry, something is truly useful because it is beautiful (The Little Prince, Ch. 14). Let me explain. The library book stacks as high as the walls filling up the whole floor generate the sense of awe and adventure in us because it gives us the experience of ‘physically’ surrounded by knowledge. It is magical and magnificent. It is amazing and beautiful. This is where all those emotional adjectives originate. 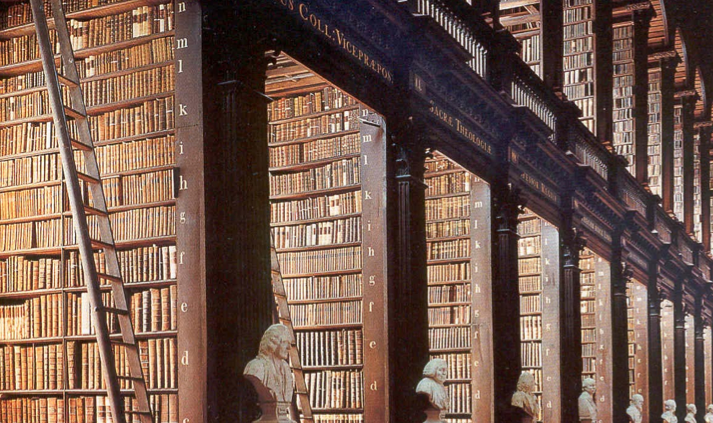 In the library stacks, we get to ‘see’ the knowledge that is much bigger than us, taller than us, and wider than us. (Think of ‘the sublime’ in Kantian aesthetics.) When our sensory organs are engaged this way, we do not experience the boredom and tediousness that we usually feel when we scroll up and down a very long list of databases and journals on a library web page. We pause, we admire, and we look up and down. We are engrossed by the physicality of the stacks and the books on them. And suddenly all our attention is present and focused on that physicality. So much so that we even forget that we were there to find a certain book or to work on a certain research topic. It is often at these moments that we serendipitously stumble upon something relevant to what we were looking for but have forgotten to do so. Between the magnificent tall stacks filled with books, you are distracted from your original mission (of locating a particular book) but are immersed in this new setting at the same time. The silence, the high ceiling, the Gothic architectural style of an old library building, and the stacks that seems to go on forever in front of us. These are all elements that can be conducive to a serendipitous discovery but “if and only if” we allow ourselves to be influenced by them. On the other hand, if you are zooming in on a specific book, all of this visual magnificence could be a nuisance and a bother. To a scholar who can’t wait to read all of the readings after physically collecting them first, the collection process is a chore at best. To this person, neither a serendipitous discovery nor the state of ‘flow’ would be no doubt more difficult to happen in between the stacks. If this is a relatively accurate description of a serendipitous discovery that we experience while browsing the physical collection on library book-stacks, what we really miss about the traditional library space may well be the physicality of its collection, the physical embodiment of the abstract concept of knowledge and information in abundance, and its effect on our mental state, which renders our mind more susceptible to a serendipitous discovery. And what we are most unhappy about the digital form of knowledge and information offered by today’s libraries could be that it is not presented in the space and environment where we can easily tune our mind into the content of such digital knowledge and information. It is the same Classical Greek text that you see when you pull out an old copy of Plato’s Meno in the narrow passage between tall book-stacks at Widener and when you pull up the text on your computer screen from the Perseus Digital Library. It is our state of mind influenced by the surroundings and environment that is different. That state of mind that we miss is not entirely dictated but heavily influenced by the environment we are present. We become different people at different places, as Alain de Botton says in his book, The Architecture of Happiness (Ch 1). Who can blame a library user when s/he finds it hard to transform a computer screen (which takes her to many digital collections and online resources from a library as well as all sorts of other places for entertainment and distraction) into the secluded and sacred space for thought and contemplation? Using Perseus Digital Library is way more efficient for research and study the classical Greek texts than using the physical collection on your stacks. However, we still miss and need the experience of browsing the physical collection on the stacks. The fact that today’s libraries no longer control the physical surroundings of a library patron who is making use of their resources doesn’t mean that there are nothing libraries can do to make the research environment facilitate serendipitous discoveries and the state of ‘flow’ in a researcher’s mind, however. Today’s libraries offer many different systems for library users to access their online resources. As I have mentioned above, the interfaces of these systems can use some vast improvement in usability. When there are as few hindrances as possible for a library patron to get to what s/he is looking for either online or at the physical library space, s/he would be able to concentrate on absorbing the content more easily instead of being bogged down with procedures. The seamless interoperability between different systems would be very much desirable for researchers. So, improving the usability of library systems will take library patrons one step closer to obtaining the flow state in their research while using library resources online. As far as the physical space of a library is concerned, libraries need to pay more attention to how the space and the environment of a library emotionally affects library patrons. Not all research and study is best performed by group-study or active discussion. Baylor University Libraries, for example, designate three different zones in their space: Silent, Quiet, and Active. While libraries transform more of their traditional stack-and-carrel space into vibrant group study rooms and conversation-welcoming open spaces, they also need to preserve the sense of the physical environment and surroundings for library patrons, because after all, all of us desire the feeling of being in a sacred and dedicated space for contemplation and deep thoughts from time to time. Such space is becoming rarer and rarer nowadays. Where else would people look for such space if not a library, which the public often equate to a building that embodies the vast amount of knowledge and resources in the physical form. Facilitating the serendipitous discovery in browsing a library collection in the digital environment is more tricky because of the limitation of the current display mechanisms for digital information. In emulating the experience of browsing books in the physical form on a computer screen, the Google WebGL Bookcase has made some progress. But it would be much more efficient combined with a large display mechanism that allows a user to control and manipulate information and resources with gestures and bodily movements, perhaps something similar to what we have seen in the movie, Minority Report. However, note that information does not have to be bound in the form of books in the digital environment and that digital books do not have to be represented as a book with pages to thumb through and the spine where its title is shown . If we set aside the psychological factors that contribute to the occurrence of a serendipitous discovery, what is essential to efficient browsing boils down to how easily (i) we can scan through many different books (or information units such as a report or an article) quickly and effectively and (ii) zoom in/out and switch between the macro level (subjects, data types, databases, journals, etc) and the micro level (individual books, articles, photographs, etc. and their content). If libraries can succeed in designing and offering such interfaces for digital information consumption and manipulation, the serendipitous discovery and the efficient browsing in the digital library environment can not only match but even exceed that in the physical library book-stacks.